In what was the repeat of the semi-finals clash of the ISL season 4, FC Goa defeated Chennaiyin FC 3-1. The Gaurs and the Chennai side shared bitter and controversial moments with each other since the inception of Indian Super League. In the finals of ISL season, 2 which is claimed to be the most controversial match wherein FC Goa were defeated by Chennaiyin FC after they revived from a three-goal deficit. The match of such intensity was played at the Marina Stadium in Chennai, wherein the Gaurs emerged victorious over the Super Machans. Dominating the field of play, FC Goa scored in as early as the 12th minute through Edu Bedia to hold an upper hand in the match. Chennaiyin FC tried to turn the tables in their favour but missed a couple of chances in the first session of play. It was in the second half that FC Goa netted yet another goal through their star striker Coro making it tougher for the home side to get back into the game. The newcomer Mortuda Fall drove the final nail into the coffin in the 80th minute taking the match away, however, Chennaiyin never gave up the fighting spirit and managed to pull a goal back in the injury time as Sabia scored a consolation goal for his team In the high-intensity match that saw a couple of yellow cards and heated arguments, FC Goa managed to dominate the play. FC Goa and Chennaiyin FC have been rivals in the Indian Super League since it has existed and this game was no different than any other game they played, filled with a lot of drama, renewed rivalry, controversies and yellow cards. Luckily the game didn’t see a red. In all, there were 6 yellow cards shown with four being shown in the first half. With a game of that intensity, the players got into fights time and again making it difficult for the referee. 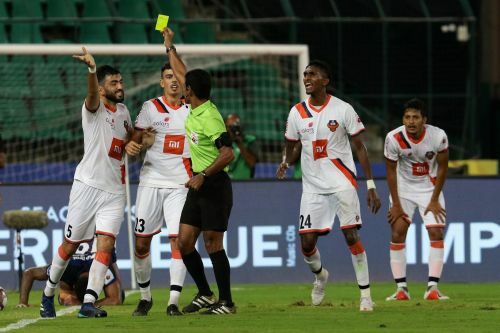 Alves and Boumous were caught in a spat and were shown yellow, rewinding back to the time FC Goa and Chennaiyin FC played the final the on-field brawl with a marquee player was taken up to the police and not much has changed since between the two teams as 21 fouls were recorded in the 90-minute game. Though Goa held the upper hand in the fixture Chennaiyin FC never gave up and made their attempts to get back into the game.